The connective tissue of any organ in the body is generally referred to as stroma. This complex network is commonly composed of leukocytes, extracellular matrix components, mesenchymal cells, and a collection of nerves, blood, and lymphoid vessels. Once viewed primarily as a structural entity, stromal cells of mesenchymal origin are now being intensely examined for their ability to directly regulate various components of immune cell function. There is particular interest in the ability of stromal cells to influence the homeostasis, activation, and proliferation of T lymphocytes. One example of this regulation occurs in the lymph node, where fibroblastic reticular cells support the maintenance of naive T cells, induce Ag-specific tolerance, and restrict the expansion of newly activated T cells. In an effort to highlight the varied immunoregulatory properties of fibroblastic reticular cells, we reviewed the most recent advances in this field and provide some insights into potential future directions. The life cycle of T lymphocytes begins in the thymus as immature precursor T cells undergo positive and negative selection to mature into CD4+ and CD8+ single-positive cells (1). Following migration from the thymus, T cells recirculate from the blood through lymph nodes (LNs) into lymphatics and back into the blood, searching for the presence of their target Ag (2). When a naive T cell becomes activated in the LN by a professional APC presenting its cognate Ag, the T cell will either mount an effector response or will become tolerant to avoid autoimmunity. In the presence of appropriate costimulation, activated T cells undergo rapid clonal expansion in the LN, acquire effector functions, and gain the ability to migrate to their Ag source in peripheral tissues. The vast majority of effector T cells die during the contraction phase of an immune response, but a small fraction remain as circulating long-lived effector or central memory cells, poised to mount a robust recall response in nonlymphoid and lymphoid tissues (3). As such, the LN serves as a central site for every stage of the T cell life cycle by recruiting naive T cells from the blood, promoting naive T cell survival, providing an environment for T cell differentiation or tolerance, and influencing the homing properties of memory T cells. In addition to hematopoietic cells, the LN contains specialized stromal cells, including blood endothelial cells, lymphatic endothelial cells, follicular dendritic cells (DCs), marginal reticular cells, integrin α7+ pericytes, and fibroblastic reticular cells (FRCs) (4–6). LN-resident stromal cells were long viewed simply as structural determinants, uninvolved in immune cell homeostasis or ongoing immune responses. However, a series of publications over the past decade uncovered several fascinating immunoregulatory properties of LN stromal cells. In particular, FRCs are concentrated in the paracortical region (T cell zone) of the LN and are endowed with several functions that regulate the activity of T lymphocytes. FRCs are thought to originate from mesenchymal preadipocyte precursors in the microenvironment of the LN anlagen during ontogeny (7). Engagement of the lymphotoxin-β receptor on these precursors drives their differentiation into lymphoid tissue–organizing cells, which ultimately leads to the development of myofibroblastic precursors that give rise to mature FRCs in the postnatal LN (7–11). The T cell zone of the adult LN is especially enriched with the presence of mature FRCs characterized by the expression of podoplanin (gp38) and extracellular matrix proteins, such as ERTR-7 and collagens (6). We now know that naive T cell recruitment to and survival within LNs are maintained by FRC-derived chemokines and cytokines (12, 13). FRCs also directly induce deletional T cell tolerance and can restrict the expansion of newly activated T cells (14–19). In this article, we review the immunoregulatory characteristics of LN FRCs, with particular emphasis on how these cells organize and regulate several phases of the T lymphocyte life cycle. The random joining of TCR regions during T cell development produces a naive T cell repertoire with only a few cells with high affinity for any individual peptide–MHC (20, 21). To trigger an effective immune response, this rare population of T cells must initially engage an APC presenting its cognate Ag. To increase the likelihood of encountering its target Ag, naive T cells continuously circulate between lymphoid organs, such as the Peyer’s patches, spleen, and LNs (22). Circulating T lymphocytes enter the LN through specialized blood vessels named high endothelial venules (HEVs) (2, 23). FRCs surround HEVs and interact with extravasated platelets in the perivenular space to maintain HEV integrity during lymphocyte trafficking (24). This regulation requires the ligation of FRC-bound gp38 to the C-type lectin receptor CLEC-2 on platelets. Activated platelets then release sphingosine-1-phosphate in the perivenular space, which maintains adherens junctions between HEVs (24). Loss of FRC-bound gp38 or CLEC-2 expression on platelets compromises LN vascular integrity at steady-state and during immune responses (24). The absence of CLEC-2 on platelets also leads to a defect in T and B cell recirculation through the LNs after repeated immunizations (25). Lymphocyte chemoattractants CCL19, CCL21, and CXCL12 are expressed by LN FRCs and function to support naive T cell trafficking across HEVs and retain T cells in the LN paracortex through their ligation to CCR7 and CXCR4 (6, 12, 26–28) (Fig. 1A). After exiting the HEVs, naive T cells use the FRC network as a defined structural path to migrate within the paracortex, according to the chemokine gradients. The survival and homeostasis of naive T cells that reach the T cell zone are also supported by FRC-derived IL-7 (13) (Fig. 1B). Accordingly, disruption of the FRC network during HIV-associated LN fibrosis significantly correlates with a reduced number of naive CD4+ T cells in the LN (29). Indeed, LN fibrosis in models of SIV in rhesus macaques restricts T cell access to FRC-derived IL-7, which drives apoptosis in both naive CD4+ and CD8+ T cell populations (30). Treatment of SIV-infected macaques with agents that reduce LN fibrosis preserves the FRC network and is associated with larger CD4+ T cell populations in the LNs compared with untreated controls (31, 32). Genetic ablation of LN FRCs in mouse models alters T cell localization in the paracortex, decreases T cell survival, and impairs Ag-specific T cell priming (33). By maintaining HEV integrity and secreting soluble mediators to facilitate migration and survival, FRCs place T cells in position to locate their cognate Ag. Lymph node paracortex. LN FRCs regulate several aspects of the T cell life cycle. (A) FRCs facilitate lymphocyte arrival and organization in the LN. FRC-derived chemokines CCL19 and CCL21 support naive T cell trafficking across HEVs and retain T cells in the LN paracortex through their ligation to CCR7. (B) T cell survival is maintained by FRCs. FRC-derived IL-7 supports the survival and homeostasis of naive T cells that reach the T cell zone. (C) FRCs facilitate the interactions between Ag-presenting DCs and T cells. The trafficking of migratory DCs to the LN is induced by the ligation between the CCR7 receptor on DCs and FRC-derived chemokines CCL19 and CCL21. Upon arrival in the LN, DC migration along the FRC network requires the engagement of DC-expressed CLEC-2 to gp38 on FRCs. Disruption of this signaling axis ultimately leads to reduced T cell priming. (D) FRCs induce T cell tolerance via the expression of peripheral tissue–restricted Ags. Upon Ag presentation, FRCs induce deletional tolerance of MHC class I–restricted CD8+ T cells and hyporesponsiveness of MHC II–restricted CD4+ T cells. (E) FRCs restrict the expansion of newly activated T cells. Activated T cells release IFN-γ and TNF-α, which act synergistically to endow FRCs with suppressive capabilities, mediated through the activity of NO. This suppression occurs in an Ag-independent fashion, which may ultimately be required to protect the organ from excessive swelling and damage during ongoing immune responses. (F) FRCs influence the maintenance of memory precursor effector cells. Ablation of FRCs during the late phase of an immune response leads to a modest reduction in the percentage of memory precursor effector cells. The mechanism controlling this reduction has not been determined, although FRC-derived IL-7 and IL-15 are hypothesized to be involved. After arrival in the LN via HEVs, naive T cells spend ∼8–12 h exploring the LN parenchyma for their cognate Ag (34). FRCs directly facilitate Ag availability to T cells by creating a conduit system that extends deep into the LN parenchyma, as well as by supporting migratory DC entry, maturation, and trafficking into the LN from peripheral tissues. FRCs secrete and ensheath extracellular matrix components to form a reticular conduit network within the T cell zone of the LN and spleen (6, 35–38). This system functions as a molecular sieve, allowing expedited delivery of chemokines and small soluble Ags from upstream tissues into the parenchyma of draining LNs (37, 39) (Fig. 1). Small lymph-borne Ags from the conduit are sampled by LN-resident DCs and subsequently presented to T cells (37, 40). Under inflammatory conditions, a second flux of Ag-loaded migratory DCs arrives in the LN and presents Ag to primed T cells (40). This trafficking and upregulation of costimulatory molecules are induced by the ligation between the CCR7 receptor on DCs and FRC-derived chemokines CCL19 and CCL21 (41, 42) (Fig. 1C). Upon arrival in the LN, migratory DCs cross the floor of the subcapsular sinus and infiltrate the parenchyma. Similar to naive T cells, DCs also use the reticular FRC network as a scaffold to navigate within the T cell zone (26), which increases potential interactions between Ag-bearing DCs and naive T cells. In addition to chemokine gradients (41), DC migration along FRC networks depends on signaling between CLEC-2 and its ligand gp38 (43). Engagement of DC-expressed CLEC-2 to gp38 on FRCs promotes actin polymerization in DCs, which facilitates spreading, protrusion extension, and migration along FRC networks (43). Disruption of this signaling pathway causes impaired DC trafficking to and within the LN, ultimately leading to reduced T cell priming (43). In addition to modulating DC motility, the CLEC-2–gp38 axis influences the contractility of FRCs (44, 45). At steady-state, gp38 maintains FRCs in a highly tense and contracted state within the LN reticular network. CLEC-2 ligation inhibits gp38 signaling, which causes FRCs to stretch and expand as a result of the relaxation of their actomyosin cytoskeleton (44, 45). Effectively, the same Ag-bearing DCs that initiate T cell priming during an immune response also cause relaxation of the FRC network, which allows space for T cell influx and clonal expansion (44, 45). The priming instructions received by naive T cells in the LN either trigger effector T cell differentiation or produce functionally inert clones that remain in a hyporesponsive state or eventually become deleted. The immune system has evolved such that this priming fate depends primarily on whether naive T cells harbor a TCR specific for a potentially dangerous foreign Ag or contain receptors that recognize self-peptides. Despite the immune system’s design to eliminate self-reactive clones in the thymus during negative selection, a relatively high frequency of T cells with autoreactive potential escape into the periphery (46). Therefore, mechanisms to enforce peripheral tolerance are critical for the prevention of autoinflammation and tissue destruction. Until recently, steady-state trafficking of Ag-loaded immature DCs was widely accepted as the primary mechanism of peripheral deletional tolerance (47, 48). However, a report from Lee et al. (14) in 2007 identified an important role for LN stromal cells in inducing CD8+ T cell tolerance (Fig. 1D). A transgenic model system was used for this study, whereby a truncated form of OVA (tOVA) was expressed as a self-Ag under the control of the intestinal fatty acid–binding protein (iFABP) promoter (49). As expected, adoptive transfer of OVA-specific CD8+ T cells (OTI) led to proliferation in gut-draining tissues, such as the mesenteric LNs (MLNs) and Peyer’s patches. Surprisingly, however, transferred cells also proliferated in the nondraining LNs. This proliferation even occurred when DCs and other bone marrow–derived APCs were prevented from presenting Ag (14). These data led to the discovery that CD45− gp38+ nonhematopoietic stromal cells were responsible for the presentation of tOVA and subsequent activation of OTI cells (14). Most notably, after some initial proliferation, the adoptively transferred T cells were subsequently lost from the T cell pool, highlighting the tolerogenic capacity of LN stroma (14). Advances in purification techniques for LN stromal cells (50) led to the identification of FRCs as the specific stromal cell population responsible for the ectopic expression of tOVA in the iFABP-tOVA mouse (15). These techniques also allowed Malhotra et al. (6) to conduct a comprehensive transcriptomic analysis of different LN stroma cell subsets. Pairwise analyses of ligands and cognate receptors across stroma and hematopoietic cells suggested a number of potentially interesting interactions. Notably, upregulation of MHC class II (MHC II) by FRCs in response to inflammatory stimuli suggests that FRCs might also tolerize class II–restricted CD4+ T cells (6). Dubrot et al. (16) substantiated this notion with a recent study showing that FRCs express low levels of endogenous MHC II through the PIV promoter region of CIITA, a known master regulator of class II expression. The study also provided evidence that MHC class II on FRCs also can be acquired from DCs via a contact-dependent mechanism involving the transfer of DC-derived MHC II+ exosomes (16). Accordingly, DCs pulsed with FITC-labeled OVA also were able to transfer peptide-loaded MHC II complexes to FRCs (16). To assess the influence of this peptide-loaded MHC II transfer on CD4+ T cells in vivo, the investigators used the CD11cDOG mouse model in which OVA protein is exclusively expressed by DCs (51). OVA-specific CD4+ T cells (OTII) precultured with FRCs from these mice exhibited a delayed proliferative response upon restimulation with anti-CD3/CD28 Abs (16). Based on these findings, it was proposed that FRCs acquired OVA-MHC II complexes from DCs in vivo, which endowed them with the ability to induce Ag-specific CD4+ T cell hyporesponsiveness (16) (Fig. 1D). Altogether, these studies elucidated a role for FRCs in Ag presentation and T cell anergy. In addition to tolerizing T cells through direct Ag presentation, FRCs can limit T cell responses by curtailing the expansion of newly activated T cell pools. This proliferative restriction applies to CD4+ and CD8+ T cells and, surprisingly, occurs independently of Ag presentation (17–19). According to several reports, T cells activated by either anti-CD3/CD28 Abs or peptide-pulsed DCs experienced delayed division kinetics when cocultured with FRCs (17–19). Additional FRC:T cell coculture experiments from mice deficient for candidate mediators revealed a molecular cross-talk whereby T cell–derived IFN-γ and TNF-α act synergistically to endow FRCs with suppressive capabilities that are mediated through the activity of inducible NO synthase (iNOS) (17–19) (Fig. 1E). In Transwell assays, the suppressive affects of FRCs were significantly diminished, indicating contact dependency or a requirement for close cellular proximity (17–19). The existence of FRC-mediated T cell suppression was corroborated in vivo. Compared with wild-type iFABP-tOVA mice, Lukacs-Kornek et al. (17) showed enhanced proliferation of OTI T cells transferred into iFABP-tOVA mice lacking iNOS expression. Similar proliferation trends were observed using iNOS−/− mice infected with OVA-expressing vesicular stomatitis virus (19) or immunized with OVA-loaded bone marrow DCs (18). Given the current data, we can only speculate on the reasons for this suppressive relationship. One possible clue may come from the in vivo expression profile of iNOS in FRCs. As reported by immunostaining of skin-draining LNs and MLNs, OTI T cells transferred into iFABP-tOVA mice induced iNOS expression in only a proportion of FRCs in vivo (17). This result, coupled with the fact that FRCs in vitro attenuated T cell proliferation without complete abrogation (17–19), suggests that FRCs may exist as a heterogeneous population with regard to their suppressive capacity. Indeed, functional heterogeneity of FRCs was described recently for their B cell homeostatic potential (33). Therefore, it is possible that FRCs reside in discrete microdomains that promote T cell proliferation in a spatially and temporally restricted fashion, while limiting uncontrolled T cell expansion. Ultimately, this mechanism may be required to protect lymphoid organs from excessive swelling and damage during ongoing immune responses. Although we know that FRCs proliferate and expand to accommodate LN enlargement during immune responses (52, 53), whether and how these cells regulate changes in LN structure during inflammation remain completely unknown. More in vivo studies are needed to test the validity of this hypothesis. Can FRCs influence the differentiation of T cells? Differentiation of naive T cells into regulatory cells, specific helper subsets, or long-lived memory cells represents the final stages of the T lymphocyte life cycle. The involvement of LN stroma in this final stage can be investigated using a variety of techniques, including LN transplantation models. Upon LN transplantation, graft-derived LN stroma are largely retained in the transplant, whereas all hematopoietic cells migrate out of the LN and are replaced by host-derived hematopoietic cells (54, 55). As such, this system has provided a useful tool for investigating location-specific properties that are intrinsic to stroma. The capacity of LN stroma to induce the generation of de novo regulatory T cells (Tregs) was explored in a recent study (56) in which liver-draining celiac LNs and gut-draining MLNs were transplanted into the popliteal fossa after excision of the endogenous popliteal LN. Compared with transplanted popliteal LN controls, celiac and MLNs represented a significantly superior environment for de novo Treg differentiation from adoptively transferred naive Foxp3− CD4+ OTII T cells (56). Interestingly, the ability to induce Tregs was not recapitulated when LNs were transplanted from germ-free mice or mice with vitamin A deficiency (56). The phenomenon also required the presence of DCs, because Treg generation was abolished when DCs were depleted (56). Overall, these data suggest a model whereby the intestinal microenvironment imprints LN stroma with Treg-inducing properties that are ultimately fulfilled via a synergistic relationship with DCs. Given their interactions with DCs (43) and their density within the T cell zone (4), FRCs may be the main LN stromal population responsible for Treg induction in this model. It is also possible that FRC-derived NO might act directly on newly activated T cells to induce Tregs. In line with this hypothesis, work by Liew and colleagues (57, 58) showed that NO can promote the generation of CD4+ CD25+ Foxp3− Tregs with both in vitro and in vivo suppressive functions. FRCs also may regulate T cell differentiation by supporting the maintenance of memory precursor effector cells (MPECs) and long-lived memory populations. A recent report by Denton et al. (59) provided some validation to this hypothesis by showing a modest reduction in MPEC percentages following FRC depletion during the late phase of an ongoing influenza virus infection. Interestingly, FRC ablation reduced the percentage of MPECs without negatively impacting the abundance of short-lived effector cells (59). Selective reduction of MPECs likely occurred in response to decreased FRC-derived IL-7, which is known to support MPEC formation (60) (Fig. 1F). IL-7 and IL-15 are prosurvival factors for both CD4+ and CD8+ LN-homing central memory T cells (61–65). Therefore, it is not surprising to find that resting LN CD8+ central memory T cells closely mirror the microanatomical distribution of naive CD8+ T cells (66), whose survival is also supported by FRC-derived IL-7 (13). Although CD4+ memory T cells are already known to associate with IL-7–expressing VCAM-1+ stroma cells in the bone marrow (67), additional studies are needed to formally test whether CD4+ memory T cells preferentially reside on IL-7–producing LN FRCs. Additionally, FRCs were recently shown to express IL-15 in vivo (68), adding to their potential role as supporters of memory T cell maintenance (Fig. 1F). Over the past decade, our understanding of the immunological relevance of the stroma has grown significantly. Based on recent and emerging evidence, the role of stromal cells within the LN is now appreciated to be more complex than their previous categorization as a mere structural entity. We now know that FRCs govern lymphocyte recruitment and organization in the LN and support encounters between Ag-presenting DCs and T cells. FRCs also induce deletional tolerance via Ag presentation and are expected to participate in the generation of inducible Tregs within gut-draining LNs. During clonal expansion, FRCs restrict proliferation within the expanding T cell pool and are involved in the maintenance of memory precursor effector cells. By participating in the homeostasis, activation, and differentiation of T lymphocytes, FRCs are emerging as essential regulators of T cell immunity. Given their diverse immunoregulatory properties, FRCs are now being explored for their therapeutic potential in settings with immunological dysregulation. In a recent report from Fletcher et al. (69), FRCs were used as a novel anti-inflammatory therapy for the treatment of high-mortality murine sepsis. In this system, FRCs offer enhanced survival in mice with either LPS endotoxemia or cecal ligation and puncture sepsis by dampening the expression of proinflammatory cytokines in the peritoneum and blood via an iNOS-dependent mechanism (69). To fully uncover the therapeutic potential of FRCs, additional research is needed to identify the underlying molecular mechanisms that induce these cells to become immunostimulatory or immunosuppressive. Identifying the soluble mediators and signaling pathways that control the function of FRCs should allow researchers to better predict how these cells might behave in a particular therapeutic setting. In the coming years, we anticipate additional discoveries that will expand our understanding of the immune functions of FRCs and inform the development of therapies to treat infections, cancer, and autoimmune disorders. We thank Viviana Cremasco, W. Nicholas Haining, and Austyn Ellese Mayfield for critical reading of the manuscript. This work was supported by a Howard Hughes Medical Institute Gilliam Fellowship for Advanced Study (to F.D.B.).
. 2006. A central role for central tolerance. Annu. Rev. Immunol. 24: 571–606.
. 2010. The stromal and haematopoietic antigen-presenting cells that reside in secondary lymphoid organs. Nat. Rev. Immunol. 10: 813–825.
. 2013. 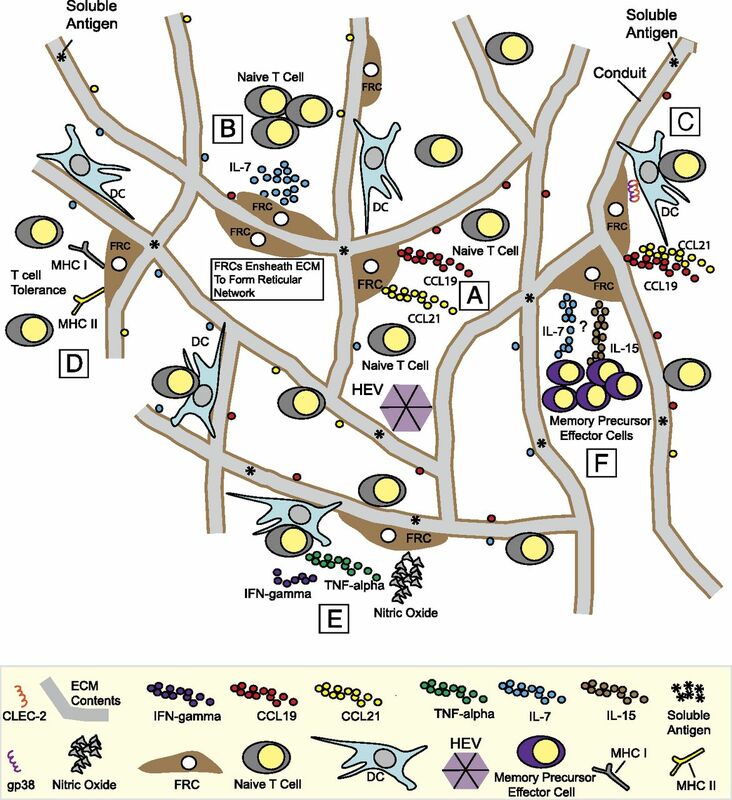 Stromal and hematopoietic cells in secondary lymphoid organs: partners in immunity. Immunol. Rev. 251: 160–176.
. 2012. Transcriptional profiling of stroma from inflamed and resting lymph nodes defines immunological hallmarks. Nat. Immunol. 13: 499–510.
. 2012. Lymphotoxin-β receptor signaling through NF-κB2-RelB pathway reprograms adipocyte precursors as lymph node stromal cells. Immunity 37: 721–734.
. 2010. New insights into the development of lymphoid tissues. Nat. Rev. Immunol. 10: 664–674.
. 2013. Maturation of lymph node fibroblastic reticular cells from myofibroblastic precursors is critical for antiviral immunity. Immunity 38: 1013–1024. Roozendaal, R., and R. E. Mebius. 2011. Stromal cell-immune cell interactions. Ann. Rev. Immunol. 29: 23–43.
. 2012. Interdependence of stromal and immune cells for lymph node function. Trends Immunol. 33: 264–270.
. 2000. Coexpression of the chemokines ELC and SLC by T zone stromal cells and deletion of the ELC gene in the plt/plt mouse. Proc. Natl. Acad. Sci. USA 97: 12694–12699.
. 2007. Peripheral antigen display by lymph node stroma promotes T cell tolerance to intestinal self. Nat. Immunol. 8: 181–190.
. 2010. Lymph node fibroblastic reticular cells directly present peripheral tissue antigen under steady-state and inflammatory conditions. J. Exp. Med. 207: 689–697.
. 2014. Lymph node stromal cells acquire peptide-MHCII complexes from dendritic cells and induce antigen-specific CD4+ T cell tolerance. J. Exp. Med. 211: 1153–1166.
. 2011. Regulated release of nitric oxide by nonhematopoietic stroma controls expansion of the activated T cell pool in lymph nodes. Nat. Immunol. 12: 1096–1104.
. 2011. Regulation of T cell priming by lymphoid stroma. PLoS ONE 6: e26138.
. 2011. Fibroblastic reticular cells from lymph nodes attenuate T cell expansion by producing nitric oxide. PLoS ONE 6: e27618. Jenkins, M. K., H. H. Chu, J. B. McLachlan, and J. J. Moon. 2010. On the composition of the preimmune repertoire of T cells specific for peptide-major histocompatibility complex ligands. In Ann. Rev. Immunol. 28: 275–294.
. 1995. High endothelial venules (HEVs): specialized endothelium for lymphocyte migration. Immunol. Today 16: 449–457.
. 2013. Podoplanin maintains high endothelial venule integrity by interacting with platelet CLEC-2. Nature 502: 105–109.
. 2014. CLEC-2 is required for development and maintenance of lymph nodes. Blood 123: 3200–3207.
. 2006. Stromal cell networks regulate lymphocyte entry, migration, and territoriality in lymph nodes. Immunity 25: 989–1001.
. 2007. CCR7 ligands control basal T cell motility within lymph node slices in a phosphoinositide 3-kinase-independent manner. J. Exp. Med. 204: 1167–1179.
. 2007. CCR7 ligands stimulate the intranodal motility of T lymphocytes in vivo. J. Exp. Med. 204: 489–495.
. 2006. Lymphatic tissue fibrosis is associated with reduced numbers of naive CD4+ T cells in human immunodeficiency virus type 1 infection. Clin. Vaccine Immunol. 13: 556–560.
. 2011. Cumulative mechanisms of lymphoid tissue fibrosis and T cell depletion in HIV-1 and SIV infections. J. Clin. Invest. 121: 998–1008.
. 2014. Antifibrotic therapy in simian immunodeficiency virus infection preserves CD4+ t-cell populations and improves immune reconstitution with antiretroviral therapy. J. Infect. Dis. DOI: 10.1093/infdis/jiu519.
. 2013. Reduced inflammation and lymphoid tissue immunopathology in rhesus macaques receiving anti-tumor necrosis factor treatment during primary simian immunodeficiency virus infection. J. Infect. Dis. 207: 880–892.
. 2014. B cell homeostasis and follicle confines are governed by fibroblastic reticular cells. Nat. Immunol. 15: 973–981.
. 2008. Monitoring cellular movement in vivo with photoconvertible fluorescence protein “Kaede” transgenic mice. Proc. Natl. Acad. Sci. USA 105: 10871–10876.
. 1997. Cords, channels, corridors and conduits: critical architectural elements facilitating cell interactions in the lymph node cortex. Immunol. Rev. 156: 11–24.
. 2008. The conduit system of the lymph node. Int. Immunol. 20: 1483–1487.
. 2005. The conduit system transports soluble antigens from the afferent lymph to resident dendritic cells in the T cell area of the lymph node. Immunity 22: 19–29.
. 2004. Lymph node fibroblastic reticular cells construct the stromal reticulum via contact with lymphocytes. J. Exp. Med. 200: 783–795.
. 2000. Lymph-borne chemokines and other low molecular weight molecules reach high endothelial venules via specialized conduits while a functional barrier limits access to the lymphocyte microenvironments in lymph node cortex. J. Exp. Med. 192: 1425–1440.
. 2003. Distinct dendritic cell populations sequentially present antigen to CD4 T cells and stimulate different aspects of cell-mediated immunity. Immunity 19: 47–57.
. 2010. Immobilized chemokine fields and soluble chemokine gradients cooperatively shape migration patterns of dendritic cells. Immunity 32: 703–713.
. 2005. CCL19 and CCL21 induce a potent proinflammatory differentiation program in licensed dendritic cells. Immunity 22: 493–505.
. 2012. Podoplanin-rich stromal networks induce dendritic cell motility via activation of the C-type lectin receptor CLEC-2. Immunity 37: 276–289.
. 2014. Dendritic cells control fibroblastic reticular network tension and lymph node expansion. Nature 514: 498–502. Astarita, J. L., V. Cremasco, J. Fu, M. C. Darnell, J. R. Peck, J. M. Nieves-Bonilla, K. Song, Y. Kondo, M. C. Woodruff, A. Gogineni, et al. 2015. The CLEC-2-podoplanin axis controls the contractility of fibroblastic reticular cells and lymph node microarchitecture. Nat. Immunol. 16: 75–84.
. 1996. Estimation of the frequency of self-reactive T cells in health and inflammatory diseases by limiting dilution analysis and single cell cloning. J. Autoimmun. 9: 667–675. Steinman, R. M., D. Hawiger, K. Liu, L. Bonifaz, D. Bonnyay, K. Mahnke, T. Iyoda, J. Ravetch, M. Dhodapkar, K. Inaba, and M. Nussenzweig. 2003. Dendritic cell function in vivo during the steady state: A role in peripheral tolerance. Ann. N. Y. Acad. Sci. 987: 15–25.
. 2004. Transfer of antigen between migrating and lymph node-resident DCs in peripheral T-cell tolerance and immunity. Trends Immunol. 25: 655–658.
. 2000. Expression of intestine-specific antigen reveals novel pathways of CD8 T cell tolerance induction. Immunity 12: 505–514.
. 2008. A novel CD11c.DTR transgenic mouse for depletion of dendritic cells reveals their requirement for homeostatic proliferation of natural killer cells. Eur. J. Immunol. 38: 2776–2783.
. 2014. Trapping of naive lymphocytes triggers rapid growth and remodeling of the fibroblast network in reactive murine lymph nodes. Proc. Natl. Acad. Sci. USA 111: E109–E118.
. 2011. Coordinated regulation of lymph node vascular-stromal growth first by CD11c+ cells and then by T and B cells. J. Immunol. 187: 5558–5567.
. 2008. Stromal mesenteric lymph node cells are essential for the generation of gut-homing T cells in vivo. J. Exp. Med. 205: 2483–2490.
. 2008. Stromal cells confer lymph node-specific properties by shaping a unique microenvironment influencing local immune responses. J. Immunol. 181: 1898–1907.
. 2014. The intestinal micro-environment imprints stromal cells to promote efficient Treg induction in gut-draining lymph nodes. Mucosal Immunol. 7: 359–368.
. 2007. Nitric oxide induces CD4+CD25+ Foxp3 regulatory T cells from CD4+CD25 T cells via p53, IL-2, and OX40. Proc. Natl. Acad. Sci. USA 104: 15478–15483.
. 2013. Nitric oxide-induced regulatory T cells inhibit Th17 but not Th1 cell differentiation and function. J. Immunol. 191: 164–170.
. 2014. Fibroblastic reticular cells of the lymph node are required for retention of resting but not activated CD8+ T cells. Proc. Natl. Acad. Sci. USA 111: 12139–12144.
. 2008. IL-7 and IL-15 differentially regulate CD8+ T-cell subsets during contraction of the immune response. Blood 112: 3704–3712.
. 2003. Interleukin 7 regulates the survival and generation of memory CD4 cells. J. Exp. Med. 198: 1797–1806.
. 2000. Interleukin-7 mediates the homeostasis of naïve and memory CD8 T cells in vivo. Nat. Immunol. 1: 426–432.
. 2009. Professional memory CD4+ T lymphocytes preferentially reside and rest in the bone marrow. Immunity 30: 721–730.
. 2014. Characterization of the IL-15 niche in primary and secondary lymphoid organs in vivo. Proc. Natl. Acad. Sci. USA 111: 1915–1920. Fletcher, A. L., J. S. Elman, J. Astarita, R. Murray, N. Saeidi, J. D’Rozario, K. Knoblich, F. D. Brown, F. A. Schildberg, J. M. Nieves, et al. 2014. Lymph node fibroblastic reticular cell transplants show robust therapeutic efficacy in high-mortality murine sepsis. Sci. Transl. Med. 6: 249ra109.